It was the mid 90s, and I was getting excited. I was an eager sponge. I was never a fan of studying anything, yet the subject of comedy and everything about it, intrigued me, and I started studying and learning more and more. It was fascinating, learning about comedians and their lives, habits and journeys. It was so cool. I don’t know how else to describe it. I also started noticing that my friends were admiring my commitment to what I was doing and the guts I had to go on stage, especially when I was barely getting laughs. I’m sure at a deeper level they did not understand. 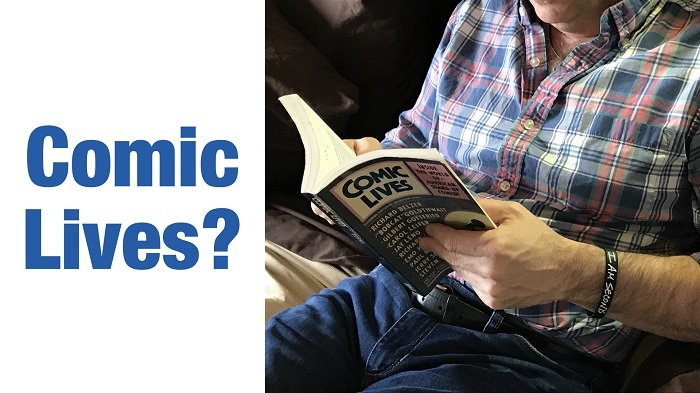 I was reading all of the books, and I had one recommended to me by Betsy Borns titled, Comic Lives. It was an old book and I think it was even out of print at that time. It was exciting to read about all my heroes and discover some new ones! I read about Richard Belzer, Jay Leno, Jerry Seinfeld, and my hero Steven Wright. Wow, again, the true life stories behind their success intrigued me. I didn’t really notice it at the time, though a shift was happening. As I got deeper into the book and learned more about the inside scoop, my emotions started shifting. I started to be aware of an underlying commonality between these famous comedians. The more I read, the more it became clear. They all had it tough in one way or another growing up. Some were bullied, others had tragedy in their lives and they used humor to cope or as their defense mechanism to be accepted. When you are required to use a skill for survival, you will get good at it. There are no other options, so when you nurture one skill set from a deep level, you will grow. You will develop a talent. You will get better through the scars of transformation. Becoming funny was a survival tactic, and standup comedy was the perfect place for that unique skill set to shine. I have not looked at the book in over 2 decades, but I remember thinking, “That is not my life.” Not at all. I grew up with great, supportive parents in a loving home. It was kind of like the Leave It to Beaver household, only my mom was the disciplinarian. If you are too young to know the T.V. program, it was about the day-to-day life in this perfect little middle class family, complete with the white picket fence. That was more how I grew up, living with a more realistic June and Ward Cleaver. Though I was bullied, humor was not my defense mechanism, but now I wished I thought of it and studied it early on. As this started to sink in, my enthusiasm was starting to feeling deflated. I went to Vinnie, my mentor and told him after reading this book, I thought, “I can’t do this.” I don’t have these enormous obstacles to overcome. I did not have a sense of humor that was developed over years growing up. When I told Vinnie, he chuckled. What? I was devastated and he was laughing? He realized how serious I was taking this revelation and he reminded me that I had issues of my own and plenty of fodder in my life. I had a lot to learn about comedy and my own persona on stage. I sincerely thought my background was not right compared to these famous comedians. Thankfully Vinnie nurtured me and got me back on course and focused on what was important, stage time and writing. Just keep going. A couple crucial insights came from this as I reflect back on this now. First, was my goal to be famous like those comedians I read about? Or was it to be on stage and feel the joy of making people laugh? There are many comedians who never become “famous”, who are amazing and talented and get to do what they love to do for a living. That was my goal back then. I just wanted so badly to do that. The famous part might have been cool, but I could love what I got to do, bring joy to people and not have to be a household name. Second, it’s great to have heroes, but we can’t compare our journey to theirs. Very few people who make it to the top of their profession got there the same way. Our unique past and starting point is going to surely require a different journey. The reason you are different may in fact be the exact reason you make it to the top. You have required different lessons, different mentors and will have a different following, no matter what your objective. Everyone’s journey is different. If you try to follow someone else’s journey, you are likely to miss your unique exit ramp. Love your own journey and you are likely to journey much farther. • When you find what you love and are passionate about your outcome, studying and learning becomes a joy. Without that it will be a grind and so you will study less which will slow your progress. • People around you will notice your commitment and you will inspire them by proxy, or they will try to talk you out of it, so you do not grow. Sometimes they do this so that they do not have to work harder or change the way they are living. When you dive all in you are literally changing your identity. Be aware. It is themselves that they don’t like and if you change and grow, they may lose you in their life or have to face the truth that they are merely existing in their current day to day grind. Healthy friends will encourage you and admire your commitment. • It’s your journey, don’t compare it to someone else’s, just learn to love your own.